I decided to test if a full install of Fluppy was possible. I'm delighted to report that it is!! for the installation. It had been used as a swap partition. I reformated it to ext3 and burnt the fluppy iso to a CD. in the save dialog box as both the label name and the linux name. Am getting a no supported PnP or PCI card found when running alsaconf, to get my sound card working, although it is working on older puppies . Sound card is es1968,OS is fluppy 007.
set the sound level with alsamixer. Downloaded and ran audacity pet ,no luck with fluppy-13 ,the sad message was:could not find any audio devices. the sad message was:could not find any audio devices. trouble setting up my machine. that claims that it solves some problems with some sound boards. and report back on this thread if it works correctly. By the way the instructions for compiling are..
however installing a sound driver could be tricky. I gave up , ES1968 sound card seems not a good pal with fluppy. Posted: Tue 03 May 2011, 13:09 Post subject: dual boot Ubuntu+fluppy013 on Acer Aspire one happy? Subject description: How to enable dual boot after frugal install on HD? I have installed fluppy to HD on acer Aspire Happy One with previously installed recent Ubuntu (with Unity). I hoped that I will have dual boot, but whenever I reboot, Ubuntu is automatically started without GRUB asking which system to boot. What should I do in order to enable dual boot? I suppose it is something about GRUB configuration? Posted: Tue 03 May 2011, 13:20 Post subject: Re: dual boot Ubuntu+fluppy013 on Acer Aspire one happy? turn on pc then quickly Hold down Shift until grub menu comes up then select OS you want to use, or when in ubuntu click in menu go to administration then find StartUP-Manager it can change grub defalt boot or other things. Already reported some while ago. Might find some comments there - can't remember, except everything still working for me on a range of different systems. You'd asked whether anyone was using the most recently updated SeaMonkey ( 2.0.0.14 I believe is the newest as you've stated above? ) and if it worked on Fluppy-13? I'm pleased to report that it's working fine and dandy here on my frugal install of Fluppy-13. However, my SeaMonkey install ( as well as my Firefox-4.0.1 and Thunderbird-3.0.19 I believe are the latest? ) are rather "unconventional installs", in that I have one of each on the first partition ( /sda1 ) of my drive followed by 14 absolute links of those installs and profiles peppered throughout the hard drive where I have either hard drive or frugal installs. Posted: Tue 03 May 2011, 14:39 Post subject: Re: dual boot Ubuntu+fluppy013 on Acer Aspire one happy? But, in the grub list there is no fluppy. How to add fluppy to the list? Tatamata, what I do is install Fluppy (or any other Puppy) on a USB drive and boot up in it. 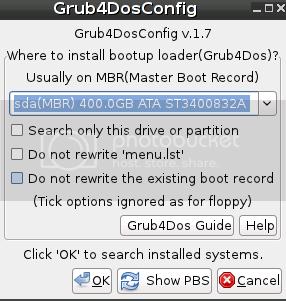 Then install grub4dos (if necessary) and run it. The application grub4dos creates a new boot-loader and menu.lst - Reboot into your hard disk and use the entry for Fluppy in menu.lst to boot it and the "Find GRUB2" entry to boot Ubuntu (or any other GRUB2 distro). If you have also installed a Fedora-based GRUB2 distro, be aware that Fedora thinks it lives in a universe by itself. From Ubuntu, run grub-update and ask it to find other OS's (it will but not Puppy). Tatamata, are you using unetbootin to install puppy? It really doesn't work that well for puppy.